And even though that is not an exhaustive list, it does show that there are many materials that can be used for stone countertops. So, what are the pros for choosing quartz? And what should you know if you are going to add them to your kitchen yourself? In this post, we will take a brief look at some specifics regarding quartz and we’ll share a link to where you can get an overview of what to consider if you are planning an install. Even though there are so many brands of quartz available, they are made the same way for the most part. If you go to each of the websites from that list, you will see that many of them will have the following information about their particular brand of quartz surface. Quartz is made by combining various substances into a composite material. Bonding resins, pigment, and stone dust is combined into a material that is then called ‘quartz’. The reason this finished product can be called quartz is because many of the brands use 93% (by weight; not volume) quartz and around 7% (by weight) bonding resin. As a result, you will see that companies will call their material “natural stone” even though it is engineered by scientists and is different form the natural stone called quartzite. This is because in reality, by mass, the material is really primarily natural. One of the main benefits of quartz surfaces is its non-porous surface. Because quartz is non-porous, it is very easy to maintain and care for. For most cleaning all you will need is warm water with some mild soap. 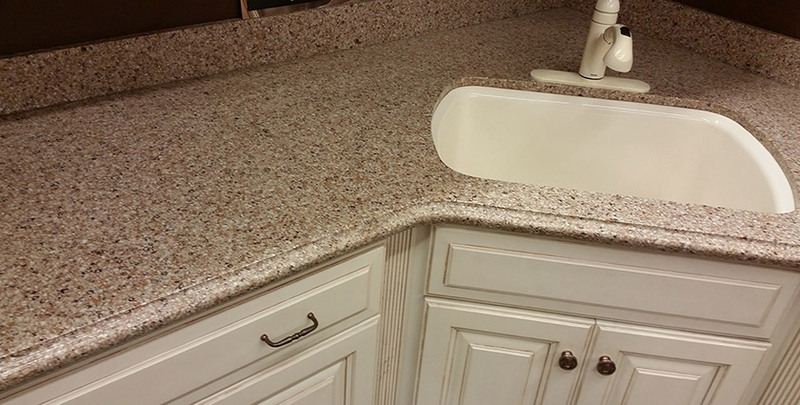 If you do need to remove a stain from your quartz surface use one of our recommended cleaners. Never use harsh chemicals on your quartz surface. liquids such as bleach, ammonia, and solvents can cause damage to the surface. Depending on which brand of quartz you look at, they will recommend specific brands of cleaning products. These brands of cleaners will vary. But they are usually not the only cleaning products that can be used on quartz surfaces. If you follow the guidelines spelled out in the care and maintenance information, you will be able to find care products that are designed for quartz by brands other than the ones mentioned in the sales information. In this area, you will find some variance. Each brand of quartz will have its own warranty length and the requirements will be different as well. There are even some that void the warranty if you do not register your surface within 30 days of the install. For this reason, It is imperative that you read the warranty information thoroughly and follow it to a T.
If you are a DIY, you might be interested in what kinds of things to keep in mind when you begin to embark on a do-it-yourself install. There are a few things that seem like common sense, once they are mentioned, but could be easily overlooked. Rather than writing out all the steps for installing quartz, I thought I would simply point you in the direction of a page that takes you through how to install quartz countertops. The bottom line is this: if you are looking to install quartz countertops yourself, be sure you know a bit about the material and what its characteristics are. And if you aren’t installing them yourself, remember, you will still need to know a bit about the material in order to take proper care of it. So take a bit of time to learn some of the basics about quartz. If you do, you will be arming yourself with the knowledge that will equip you for years of living with your beautiful, carefully selected kitchen countertops.